Philadelphia is a city know for historic sites and attractions. 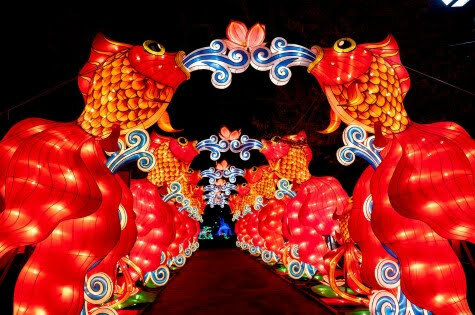 But it's also a city that highlights diverse cultural and events like the Philadelphia Chinese Lantern Festival in Franklin Square. 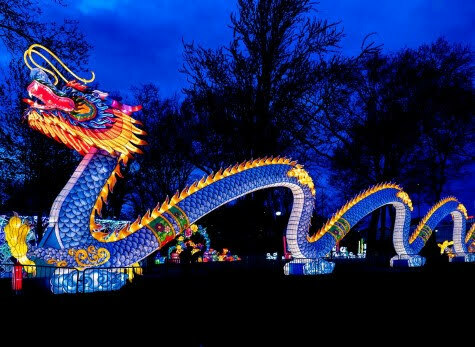 The Philadelphia Chinese Lantern Festival is a celebration of light and culture that features artisans from China creating magnificent steel-framed and silk-wrapped giant lighted sculptures, using traditional Chinese methods. 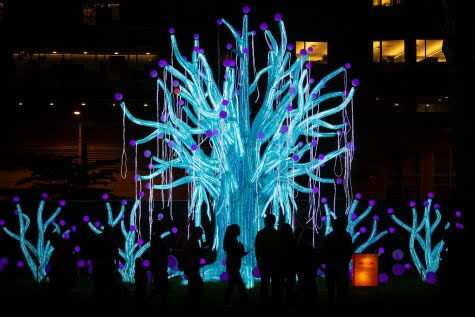 Franklin Square will glow with 28 larger-than-life illuminated groupings of 1,500 individual works of art with more than 15,000 LED lights in brilliant colors. The 200-foot giant fan favorite Chinese Dragon and beloved pandas return, but all other creations will be new for the 2018 Festival. New technology and engineering will be utilized to bring an endangered species gallery to life for the first time in the United States. Other highlights include celebrating the Year of the Dog, tropical birds and fish, mythological animals, the world premiere of a new Fairy Tree, a walk-through Great White Shark Tunnel, and an interactive elephant lantern where visitors pedal a bicycle to change its colors. The lanterns are placed all around the Square, and guests walk among the displays each evening. In addition to the gorgeous light installations, festival-goers will witness authentic cultural performances that are all new for 2018 including the unusual and impressive art of face-changing and a variety of different Chinese acrobatic acts. Visitors can taste Asian cuisine and American favorites, drink a toast at the Dragon Beer Garden open nightly, and shop for Chinese folk artists’ crafts created on site. Guests will still be able to play Philly Mini Golf, ride the Parx Liberty Carousel (additional tickets required for both), and enjoy Center City’s best play place. The lanterns are able to be viewed for free during daylight hours, while a ticket is required for nighttime entrance. Franklin Square will be open during regular daytime hours. Tickets will be general admission Sunday – Thursday, and timed tickets will be required for Friday and Saturday nights. Advance tickets are strongly recommended. After 7 pm, the Festival requires tickets for entry, which are $18 adults, $12 children ages 17 and under, and $15 senior and active military (taxes and fees included). Group prices for 20 or more people are $15 adults, $11 children ages 17 and under and must be purchased in advance. To book a group, call 215-629-5801 x209. this sounds like a colorful and unique festival. Thanks for sharing.